In 1853, thirty-three years after the first missionaries landed, a census of the islands was taken by the Government with the help of the American Board of Commissioners for Foreign Missions (ABCFM) – the first year for which a census report of the islands by districts is available. In interpreting the distribution of population in 1853, keep in mind that Hawaiian culture of that year included characteristics not originally Hawaiian. During the seventy-four years which had elapsed since ‘Contact’ was made, interactions with foreigners were frequent and trade and commerce were actively carried on. Thousands of natives were killed by disease. In 1848 and 1849 epidemics of measles, whooping cough and influenza occurred. Likewise, Hawaiians were leaving and worked on whaling ships. The distribution of population in the census districts in 1853 is indicated by the awards of land made by the Board of Land Commissioners formed by King Kamehameha III about the time of the “Great Māhele.” For the first time the common people, formerly tenants of the chiefs, received title to small holdings, known as kuleana. The land commission awarded titles to kuleana involving the hearing and taking of testimony in connection with nearly 12,000-individual claims. The number of people in a district and their distribution was closely related to the food supply of the area, which was obtained principally from planted crops and fish, supplemented by hogs and in a small way by other animals. Although sandalwood, whaling and the beginning of sugar and other agriculture formed the foundations of an economy, life was maintained largely by traditional means of subsistence agriculture and fishing. With people heading to California during the gold-rush of 1849, the lack of sufficient supplies, and the isolation of California from other food-producing areas on the continent gave people in the Hawaiian Islands an opportunity for a while to supply the growing market there. Since agricultural produce from Hawaiʻi could be marketed in California directly by boat, and therefore cheaper than by overland routes of that time, the use of arable land in the islands was stimulated. Following is the head count in Hawaiʻi – in addition, maps are included that graphically display the population distribution to the various districts and portions of each island. Niʻihau had a population of 790-people. The distribution of people as shown on the population map is based on a map of Niʻihau made by a man named Wilcox between 1850 and 1855, depicting groups of houses. In 1853 there were 6,981-people on the Island of Kauaʻi. The population was concentrated chiefly on the lower flood plains and delta plains of rivers where wet land taro was raised on the rich alluvial soil. Nearly half of the population of Oʻahu was concentrated in the City of Honolulu and on the adjoining coastal plain. In the city and vicinity there were between 7,000 and 8,000-people; nearly 1,200 of these were foreigners. Nearly all the remaining population of Oʻahu was scattered around Pearl Harbor, along the east coast of the island, and at Waialua near the center of the north coast. Molokaʻi had a population of 3,607. The outstanding characteristic of the distribution and density of people was the concentration along the eastern third of the south coast. The population of Maui was 17,574. Nearly all the people were scattered around the shores of the island and on each side of the isthmus. The largest settlement on the island was at Lāhainā, the port of which had advantages in that the roadstead was accessible “at any season of the year, … at any hour of the day or night,” and a pilot was not needed to enter it or leave it. In the spring of 1853 seventy whaling ships called at the port. The town of Lāhainā extended for two miles along the shore. The population of Lanaʻi in 1853 was 600, all of whom were Polynesians. On the east coast of the island it was possible to raise wet land taro in a small area in the upper part of Maunalei Gulch where the higher land, intercepting the trade winds, caused sufficient precipitation for a small stream of water throughout the year. Hawaiians who lived on the central part of the east coast climbed the highlands to plant their taro patches. Kahoʻolawe is remarkable by contrast with the other islands in the Hawaiian group. Much of it is a wind-swept plateau devoid of vegetation of any kind. It is not mentioned in the census report of 1853. In 1841 men from the Wilkes’ Exploring Expedition who visited the island found only a few fishermen and fifteen convicts. Kahoʻolawe was used as a place of exile, as late as 1852. Hawaiʻi, the largest island in the Hawaiian group, had the largest population, 24,450. The most densely-peopled continuous area was along the coasts of North and South Kona. Dry land taro was an important crop in the Kona districts. Breadfruit, bananas and coconuts grew there, all of which were used for food. Peas, beans, carrots and cabbages were raised in the vicinity of Kealakekua Bay, near which there was also a “coffee estate,” and between Kealakekua Bay and Kailua “oranges, grapes” and “tall plantains” grew. For the District of Puna there is an inconsistency between the number of people recorded in the census and the number of land grants which were given after the “Great Māhele.” There were 2,700 people and only nineteen grants. These were large areas and included several ahupuaʻa. 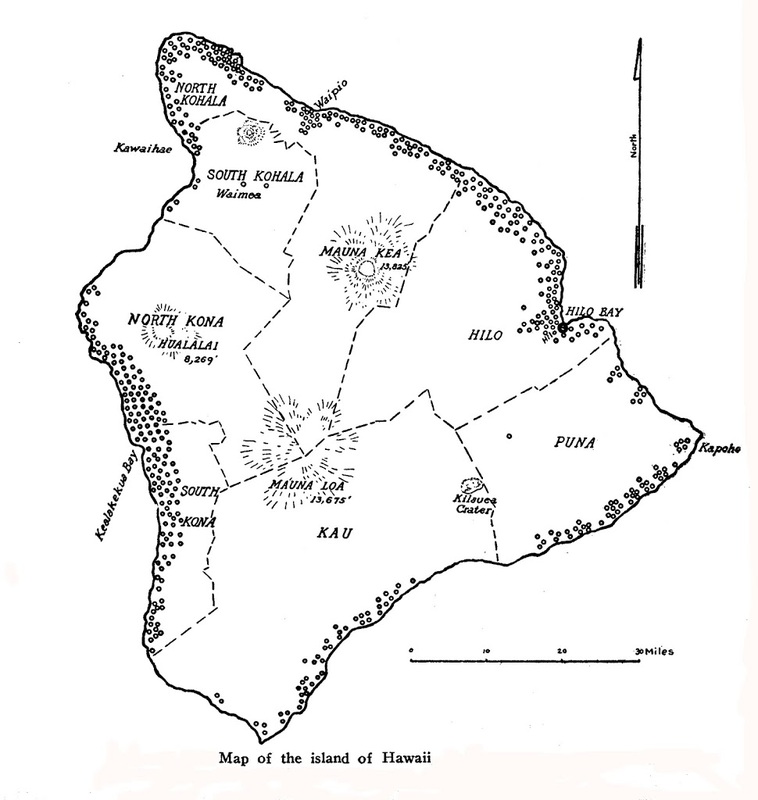 Puna was isolated; there was no road into the area until 1898 or 1899. The eastern, tradewind coast of Hawaiʻi was densely populated. Many streams flowed down the slopes of Mauna Kea into the ocean; near the mouths of which the land was used for irrigated taro. The distribution and density of people in the Hawaiian Islands in 1853 was closely related to the food supply obtained from agriculture, aquaculture and fishing. Taro, the most important plant raised for food, was cultivated both by wet land and dry land farming. Other dry land crops were also raised. Areas where wet land taro was extensively cultivated were more densely populated than areas of dry land farming. Land in the vicinity of fish ponds was densely populated. The image shows the population distribution on the Island of Hawaiʻi (1853.) In addition, I have added other related images in a folder of like name in the Photos section on my Facebook and Google+ pages.